Sixty-eight year old August Dupree is pretty certain he is on the down side of Act Three and honestly doesn't know and isn't sure if he cares if there is an Act Four. One day, he wakes from his afternoon nap to discover a ramshackle old blue Volkswagen bus has been dropped off in his driveway. Inside, he finds a sealed wooden box and a letter from an old childhood friend telling him to take the bus and the box on a road trip to New Orleans. 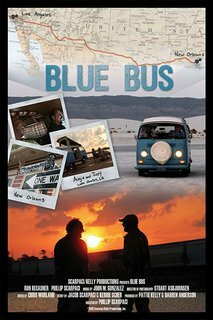 Feeling bound by his friend's last dying wish and without opening the box, 'Augie' convinces another close friend to take the road trip with him from Los Angeles to New Orleans, the city he left when he was just nineteen years old, never to return, until now. What transpires is a journey, that actually becomes a coming of age story for two middle aged guys - one who has run from his past his entire life and the other, a Peter Pan character who has never really grown up.